Wanda Jean Thompson Garvey, retired secretary, formerly of Derby and Fredonia, passed away on July 16 at the age of 93. She was born on May 28, 1925, the daughter of Ernest D. and Ella Franks Thompson and was in the Fredonia High School graduating class of 1943. In 1953, she married Lyle Clayton Garvey of Wichita. They lived in Derby, Kans., for nearly 40 years, there raising five children. For retirement they moved to a home overlooking the Verdigris River Valley northeast of Coyville, Kans. Lyle passed away in 2005 after the couple had enjoyed 53 years of marriage. Wanda worked in the home until her youngest of five children was school age, then worked as a secretary at the First Church of the Nazarene in Wichita followed by a similar position in the Department of Communicative Disorders and Sciences at Wichita State; a position she held until retirement. 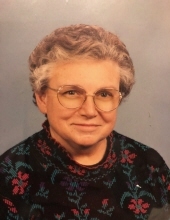 Wanda was a member of the Derby Church of the Nazarene where she taught Sunday School and adult Bible classes for over 25 years and also served on the Missionary Committee for 26 years. She continued to serve as a mentor for church activities at the Coyville Community Center through 2009. After moving to Fredonia she regularly attended the Calvary Wesleyan Church of Fredonia. Wanda was preceded in death by her parents; her husband Lyle; and also by a son, Warren. She is survived by a daughter, Barbara Flax (David), Wichita; three sons: Ernest (Sally), Simla, CO; Richard, Augusta; Ray (Teresa), Valley Center; 10 grandchildren. Funeral services to be held 11:00 A.M., Saturday, July 21, 2018 at Calvary Wesleyan Church with Pastor Scott Rose, officiating. The family will receive friends from 10:00 A.M. until service time at the church. Private graveside service for immediate family. A memorial has been established for the Coyville Community Center. Service arrangements by Wickham Funeral Home. To send flowers or a remembrance gift to the family of Wanda Jean Garvey, please visit our Tribute Store. "Email Address" would like to share the life celebration of Wanda Jean Garvey. Click on the "link" to go to share a favorite memory or leave a condolence message for the family.